Came across this out of use pneumatic tube system within the city centre the source of which is not recorded. Three tubes appear out of a manhole at George Square/North Frederick Street which is unusual in itself as the rest of the route is not recorded via any box structure. They head north up North Frederick Street then west along Cathedral Street/Bath Street where one branches off at the Bath Street/Hope Street junction to the former post office at Hope Street/Renfrew Street. The other two carry on west along Bath Street then head north up Newton Street and are marked as “Out Of Use”. Initially I thought they were Post Office related and the two Newton Street tubes were heading towards the Post Office at Charing Cross until I discovered the Queen Street Station tube. I’ve had a rummage around quite a few old PO sites – Waterloo Street/Wellington St, St Rollocks etc even on the south side – Victoria Road but can find no other recordings of tubes. Beginning to wonder now if they were sourced from the City Chambers as opposed to the former HPO. Here's the route of the Queen Street station tube. At the other end of the duct prints it appears as a line from nowhere in the middle of the road opposite 11 George Square. The X at the end of the Queen Street Sation end denotes Out Of Use. Have you actually seen these, or is it just a drawing? My initial thoughts on seeing the article was of something similar to the systems in department stores for moving cash from the tills to the office - but after re-reading it, I' suspect they are actually are talking about "blown fibre". It's a way of installing fibre optic cabling - a "cable" containing a number of plastic tubes, about 1/4 inch in diameter, is installed, then the glass fibres (about an eighth of a millimeter diameter) are "blown" through the tubes with compressed air until they come out the other end. Are these BT or NTL/cabletel drawings, by any chance? 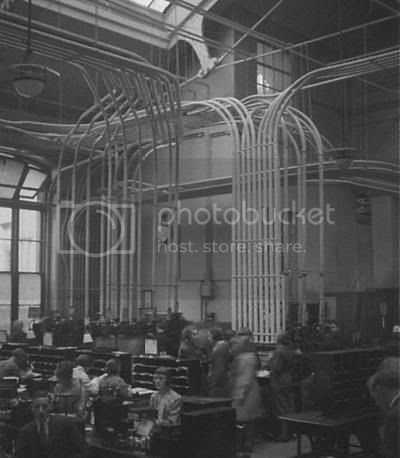 The tubes were used to send telegraph forms from local post-offices to the Central Telegraph Office, where the skilled operators were concentrated. "The underground, or street tubes are mostly 2.75 in. in diameter, but there are also a number of 3-in, tubes in use; those in the large provincial towns (Birmingham, Bradford, Cardiff, Edinburgh, Glasgow, Grimsby, Liverpool, Manchester, Newport, Leeds, Newcastle, Southampton and Swansea) are 2.75 in. There are fifty street tubes in London, varying in length from 100 to 2000 yards. It's not conclusive proof, but it makes the old GPO seem a distinct possibility. It is not easily found and it is also confusing way....but i am thankful for the information. 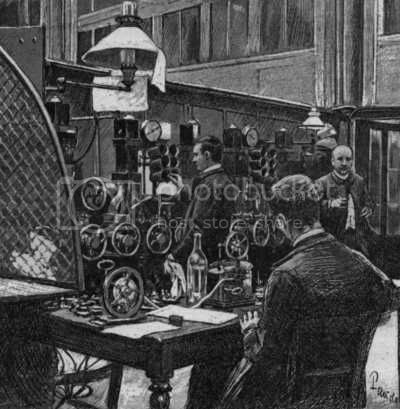 A lot of telegraph stations were situated next to railway lines and Glasgow was no exception - The British Telegraph Co. had an office in Queen Street. 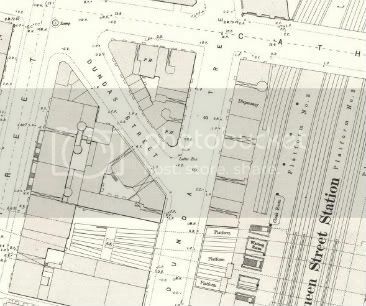 But there were also telegraph offices in St. Vincent Place and Exchange Square and these branch offices were connected to the main telegraph office via a system of pneumatic pipes. Unsurprisingly this was called PNEUMATIC DESPATCH and would probably be worth Googling. Incidentally, Lord Kelvin was instrumental in setting up the transatlantic telegraph lines. A story well worth looking up. Fibre optic cables are either blown through sub duct or a variety of blown fibre tubing types. These are installed within the existing duct structure. 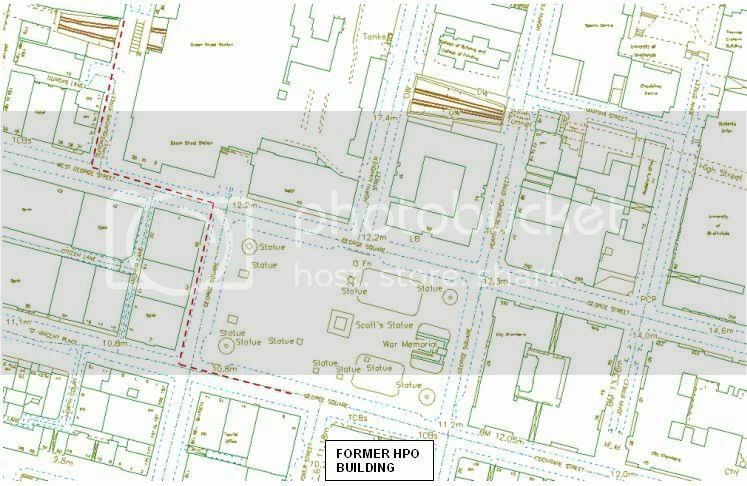 The pneumatic tubes highlighted are independent and not contained within this network, nor do they pass through the underground box framework with the exception of the manhole at George Square. According to the master records plan these tubes are at least 40+ years old. Hello Toomse , not everyone is so modern these days - many kilometres of FO cable are still pulled in the old fashioned way - on the end of a blue rope by a gang of hard working lads. I am aware of this . Didn’t think it was worth mentioning the obvious, was only responding to br-cmr’s theory.